In order to appreciate how it is valued, it is important to first understand the incredible rarity of fine, gem quality black opals and the natural miracle that lead to its formation. The formation of a black opal begun 110 million years ago, when the great inland sea upon which Lightning Ridge is situated retreated. This caused a deposit of heavy sediments around the area, which are rich in carbon, silica and manganese, the base minerals that form black opals. Over time these minerals leached out of the sedimentary layer and down into vaults and fissures in the bedrock. The dissolved silica molecules formed into a uniquely spherical shape which, when left undisturbed for millions of years, formed into a grid like structure. This structure refracts light from the gaps between the spheres into the mesmerising spectral colours we today find in black opals. The size of these spheres also determine which colours are refracted. The smaller the spheres the more the green and blue tones are created, the larger the spheres the more red and orange hues develop. These red and orange tones are more highly valued as they take longer to form and are therefore rarer. Astonishingly it is believed this process takes 5 million years to form a 1cm layer of opal bearing silica, indicating why Opals are so highly treasured. There are four valuation factors that determine the value of an Opal. These importantly provide a base system built upon their rarity in nature to celebrate the unique beauty of each stone. Each value has a different weight on the final price, colour the highest at 35%, brilliance 25%, pattern 25%, body background at 15%. Colour is valued on its prominence within the stone, transitioning from red to orange, gold, green and then finally blue. The tone of the colour is also equally as important, with bright vivid colours holding more value than dull or soft tones. Brilliance refers to the luminosity or the lustre of the colour. If you can look at a stone from across the room and the colour jumps out at you it has a higher lustre, conversely if it is muted or dullish the stone has a low lustre. Pattern refers to the way in which the colours radiate across the stone, with broader patterns attaining higher values. Attractive and captivating patterns also increase the value of a stone. Background colour refers to the tone of the body of the opal. Top rating is provided to stones that are said to have midnight sky background, with value steadily decreasing as the tone lightens to a soft grey. In our collection we are proud to present a truly exquisite example of a Lightning Ridge Black Opal, around which we have created a masterpiece to pay magnificent homage to the unique rarity of this most precious gem. This stunning 25.10 carat Opal has remarkably vivid colour predominately orange with red and gold flashes, interspaced by vivid green and blue tones that roll across the surface of the moving opal. The ring is set with custom cut white diamonds and sapphires in black rhodium plated 18 carat white gold, which further accentuates the luxury and opulence of this remarkable Opal specimen. Bill Secoss, of Gem Studies Laboratory remarked it was “a rare fine example of Lightning Ridge Black Opal” and is without question a true collector’s piece. 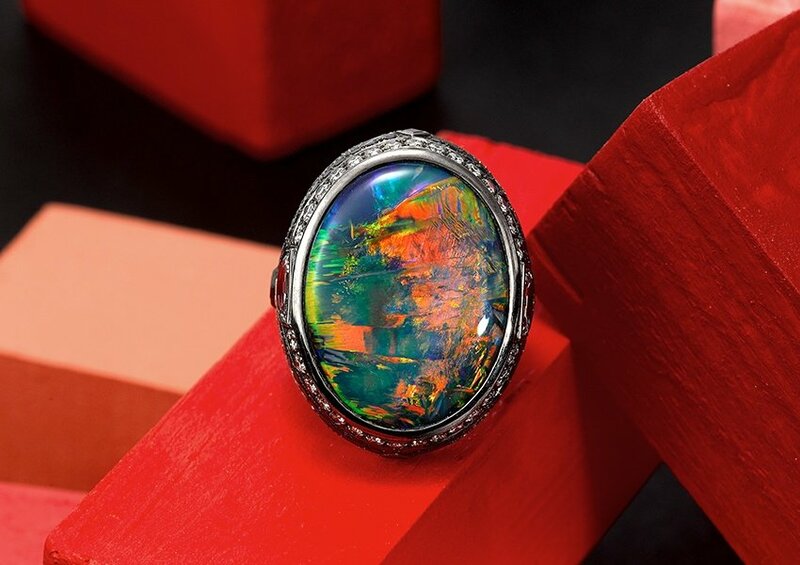 To learn more about our stunning Lightning Ridge Black Opal Ring, contact the boutique today.